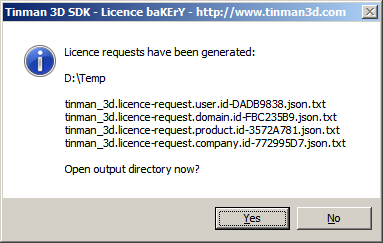 The bakery assembles the required metadata for ordering a Tinman 3D SDK licence. 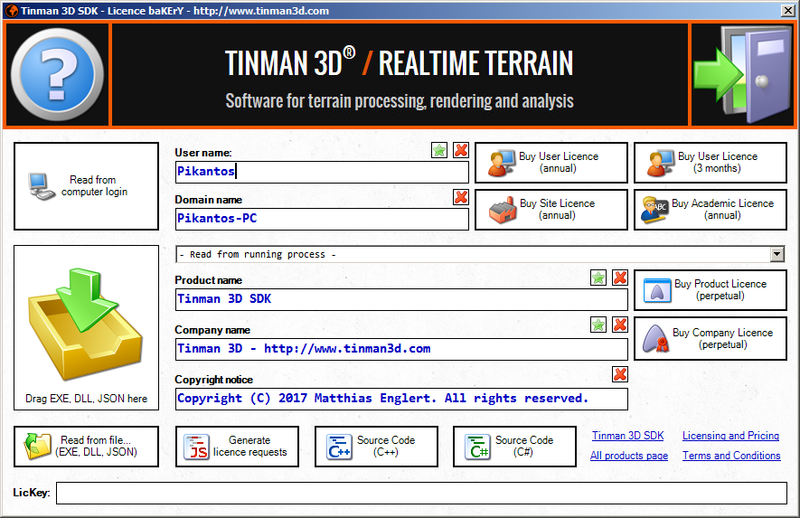 For details on the various licence types, please refer to Licensing and Pricing. Read from current computer login. Read from a running application/process. Read from a DLL/EXE file. Read from a licence request file. Once the licence metadata is complete, you can initiate an order by clicking on one of the 'Buy...' buttons. This will take you to the checkout confirmation dialog, where you can see the exact licence metadata that will be used for the order. Now click 'Go to checkout...' and you will be taken to the checkout webpage, where you can finish the order process. If you only want to assemble licence metadata but do not wish to place an order, you can generate licence request files. The requests will be based on the metadata you have provided. Using the bakery is the recommended way of purchasing a licence, because you do not have to worry about getting the licence metadata right.